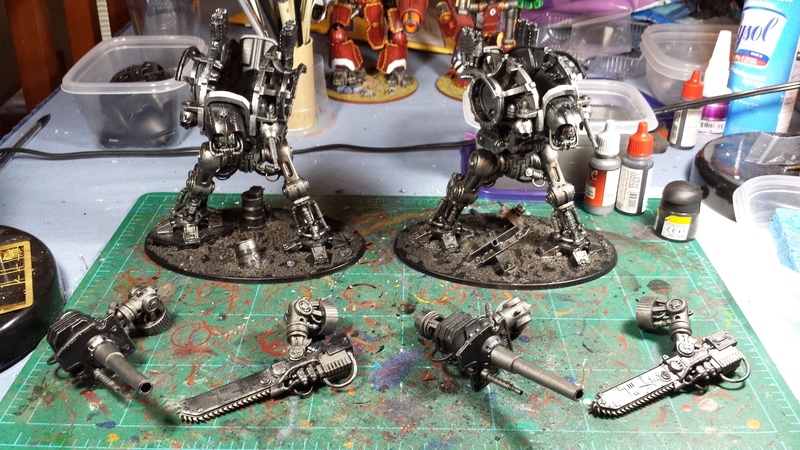 Well it should not come as no surprise that I ended up picking up a couple of the new Knights! 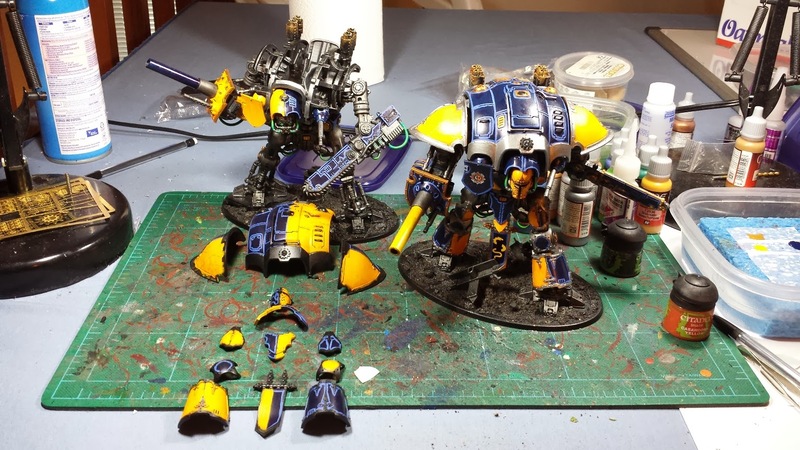 I started with a pair of Paladins, to get a feel for how the kits go together before I tried any serious conversion. While the kit allows for quite a bit of pose options with the upper torso, arms and head, the legs are more or less required to be built in the standard pose (unlike the Wraithknight which just requires a little peg removal to 'unlock' the legs). The ankles are essentially cast at an angle, so will require a bit of engineering to reposition. I followed the suggestion to leave the armour plates off in order to allow easy painting of the under-structure, which does definitely speed things up. Super fast metal basecoat/wash/drybrush and it's 90% done! 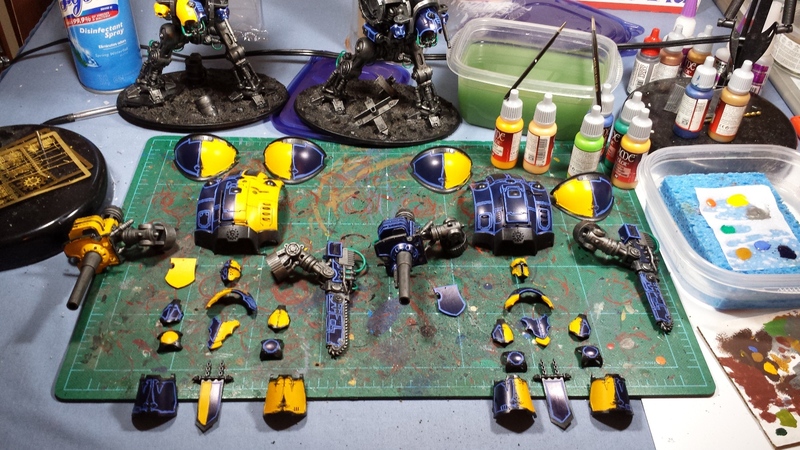 I decided to go with the colors of House Krast (see minor rant below), as I thought the blue and yellow would set off nicely against the red and white of the Adeptus Mechanicus I planned to ally them to in my Heresy armies. The plan is to paint one up as a squire and one as a knight, and the third as-yet-unbuilt one as a senechal. The squire will be predominantly blue, the knight in alternating halves, and the senechal will be in a quartered pattern. After getting the silver edging on one set of armor plates, I tacked them together to see how it looked - I quite like it! I still need to add in the various striping and iconography, which will add in a little spot color and flair. ...And now the minor rant. I was pleased to find the copy of the Knight Companion book I'd ordered when I stopped home for lunch today, and I was eager to read up on the expanded fluff on house Krast. Flipped to the relevant page and surprise! Their livery is now apparently red and white. What the?! The fluff all ties in well with the little tidbits that were previously alluded to in the old Epic materials, but there is absolutely no mention (that I can see) about the old paint scheme. 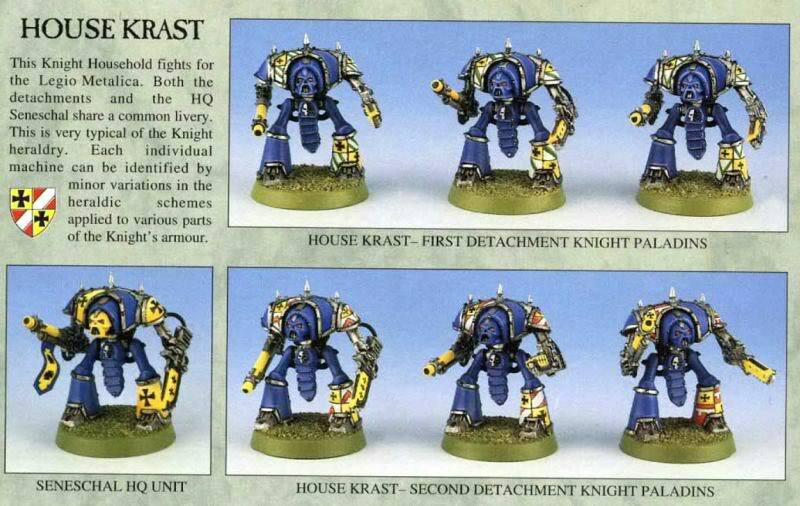 They are mentioned as having sworn fealty to the Mechanicum during the Heresy, so I'm going to be justifying it as the blue and yellow being their original scheme prior to their re-dedication (when they would presumably change their colors to the new red and white). Problem solved! AHHHHHHH - this is so great. That was pretty snappy you got those together. Brilliant work mate, very characterful. Have you seen the new ogre models? Can't wait to get my hands on those - will make some really good Praetorians. Have you got any idea, if the TF guys are still around somewhere? Old website gone and FB dead too. Amazingly fast progress! I love them. @Manus: I appreciate it! I'm torn on the new Ogryns, definitely looking forward to seeing them in person, but I agree, there's some great praetorian fodder in those kits! The Tempus Fugitives ended up disbanding (more's the pity), but a fair few of them ended up over on the Heresy30k Forums (http://heresy30k.invisionzone.com/) lots of good heresy and ad-mech stuff to be found there! @CJ Kilbride: Thanks very much! @The Eye of Error: Cheers bud! Still a ways to go on 'em, but the heavy lifting is complete at least! Looking great so far! As for the change in house colours, why not just make up your own knight house, while you're at it? It's not like the existing ones are so awesomely written that you couldn't hope to come up with something to match that. No they look fantastic. That trademark highlighting of yours looks great with these colours. How do these size up against your other Knight miniatures (Blightwheel, etc.)? Loving how you have tried to stay true to the original scheme and background. Like Zab says, they could just be pre-Mechanicus-sign-up. Either way, they look great mate, excited to see how you tackle converting the last one. 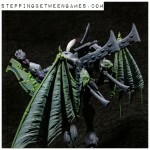 Fantastic work, really nice to see reference to classic Games Workshop. @KrautScientist: Indeed - I was doomed from the moment they were released! @Colonel Scipio: Thanks! Well, there's technically 4 so far, going to do a trio of House Krast Paladins and a Freeblade Errant of some variety! @Dai: Comparison pics ahoy! I've started dabbling on the legs for #3, pics to follow soon on those as well!